HP Split x2 13-m210dx is a lightweight and compact 13.3 inch 2-in-1 laptop with a detachable touchscreen so it can be used both as a tablet just like an IPad and a powerful i3 processor laptop with a large enough screen with great image and sound quality, at a price that won't break your budget. HP Split x2 has a 4th generation smart dual core Intel Core i3-4020Y mobile processor with hyperthreading function that makes the dual core act as four cores. 4 GB RAM is enough memory for running a few tabs and apps at the same time. It doesn't come with a regular Serial ATA hard drive but a good amount of Solid State Drive- 128 GB, enabling the system to boot up in a few seconds and run faster overall. It generates little heat, almost no noise, is much less of a burden on the battery. 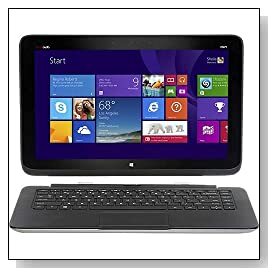 Operating system is the Windows 8, you may like it or dislike it- personal choice but great to use on a responsive touchscreen, also optimized for mouse and keyboard. 13.3 inch LED backlit touch screen with IPS technology with 178 degree viewing angles, 1366 x 768 pixel resolution and the 4th generation Intel HD Graphics 4200 on-processor graphics offering high picture quality while reducing energy consumption. Beats Audio with dual stereo speakers integrated into the screen for impressively clear sound and deep bass. The TrueVision webcam offers HD quality video and still picture and has double noise removing microphones built-in with great sound. Convertible HP Split x2 weighs just 4.9 lbs and is 0.9 inch thick so it is super portable with its 13 inch display as well. It has two 3-cell lithium ion polymer batteries- on the laptop and screen. The hinge feels quite durable so you can easily switch between laptop and tablet modes- dock and detach the screen from the keyboard. Island style keyboard is comfortable and ergonomic with chiclet keys. 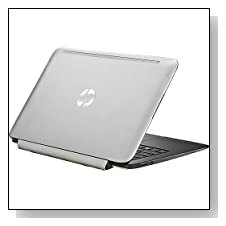 HP CoolSense technology keeps the notebook surface cool and helps you work comfortably for hours. HP Split x2 being such a slim and compact device, it doesn't have a CD/DVD drive. It has the HDMI port for viewing your computer screen on your larger HDTV. USB 3.0 port gives you fast transfer of data. Media Card Reader supporting Secure Digital and MultiMediaCard enables simple photo transfer. Other connectivity options are microphone-in/headphone-out combo jack, 802.11 bgn wireless in both tablet or laptop mode, Bluetooth 4.0 to sync with compatible devices wirelessly, a USB 2.0 port and a HD webcam with dual microphones. Conclusion: HP Split x2 may be the right one for you if you're not sure whether to buy a laptop or a tablet and want something with a fairly large screen- functionality and versatility of tablet/laptop, compact and lightweight factor, power and speed of Haswell i3 processor, good quality video and audio and nice looks at an affordable price. Some of you may prefer having Windows 7, but try Windows 8 (especially Windows 8.1 which is a simple upgrade through Microsoft Store) for a bit and see how good it feels. I'm not sure if you ever use a DVD drive but this one doesn't have one- making this computer more portable. Highly recommended if you're looking for a convertible PC with a relatively large screen.